Inspired by the fourth Generation 750i comes the Car BMW Alpina B7, it is tough enough to go against Mercedes S63 AMG and Audi S8, a rear wheel drive (RWD) car and with the length that is based on the BMW 750i car. BMW Alpina B7 has a supercharge V-8 producing 500 horsepower, this Car is performing a marvelous acceleration from 0 to 60 mph in just 4.8 seconds, but yet we still don't know why BMW did not name this Car under their M series. 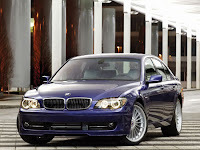 The BMW Alpina B7 engine is a supercharged version of the 4.4-liter V-8. This Car has the 745i's engine that has been modified, supercharged, which results a 500 hp @ 5,500 rpm and 516 lb ft of torque @ 4,250 rpm, this Car BMW Alpina B7 can reach a top speed of 186 mph, it has a 6 speed transmission and has the semi automatic shift buttons control on the steering wheel, this car BMW Alpina B7's fuel consumes 23 mpg on the highway. Front Head Room: 39.2 in. Front Shoulder Room: 59.3 in. Rear Shoulder Room: 58.7 in. Luggage Capacity: 18 cu. ft. Maximum Cargo Capacity: 18 cu. ft.
Fuel Tank Capacity: 23.3 gal.